Distinguishable by their squarish bodies, coachbuilt demountables are often of a sandwich construction, i.e. with a frame of wood or aluminium, and panels of insulating material sandwiched between an inner wall, probably of ply, and an outer skin of aluminium or fibreglass (GRP). 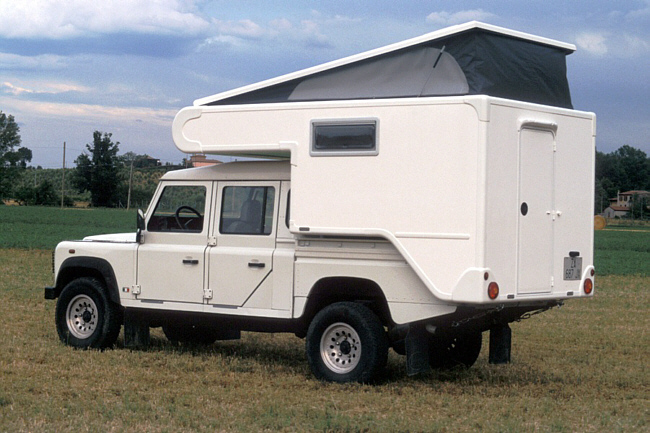 Coachbuilt campers can be very light and so can be adapted to fit even quite small pickups. Lighter weight can also mean more available payload for equipment and personal possessions and greater fuel economy. Their square and flat wall panels make them easier, and therefore cheaper, to manufacture and this is normally reflected in their retail price. They do need to be very carefully designed and built in order to cope with the stresses of mounting and dismounting and of travel. In a poorly built coachbuilt these can cause frame joints to open leading to leaks and other structural problems. Monocoque bodies are moulded, normally in GRP, using the same techniques as in plastic boat building. The resulting single-skinned body shell, which in some cases consists of only two mouldings, typically has rounded corners and curved surfaces. All these curves can produce a very aerodynamic appearance but they also help to add strength and rigidity to the shell. However, the curves and the lack of a structural frame make it more difficult, and therefore more expensive, to fit out and furnish the shell. Again, this tends to be reflected in the retail price. Obviously, if it's built properly a monocoque body shell can't leak anyway, but the nature of the material and the construction technique means it is much better able to absorb the inevitable flexing when mounting or dismounting and the vibration of road travel. Fibreglass monocoque bodies tend to be heavier than similarly-sized coachbuilt bodies. It is surprising, in that it is common practice in the manufacture of C-class and low-profile motorcaravans, that combining the methods of construction is very rare in demountable design. Tischer's 'Trail' series is one of the few examples of a demountable body which involves both; with a moulded roof and luton and flat, sandwich-built wall panels. Artica were proposing to introduce a similar model in 2008 but, as far as I know, it is still not in production. These are what many of us think of as the typical demountable camper - they are certainly the most common in the European market. Because of their volume and shape they are able to offer similar levels of equipment and comfort as other kinds of large motorcaravan and, like them, they offer the convenience of being immediately ready to use once the vehicle is parked. 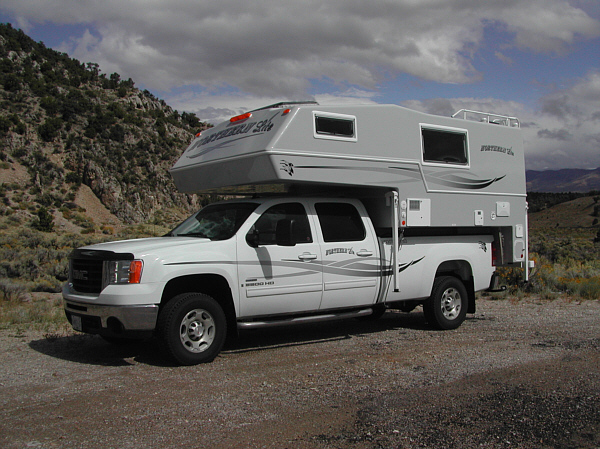 They are known as hard-side campers in the U.S. where larger models even come with slide-out extensions to make the interior more spacious. 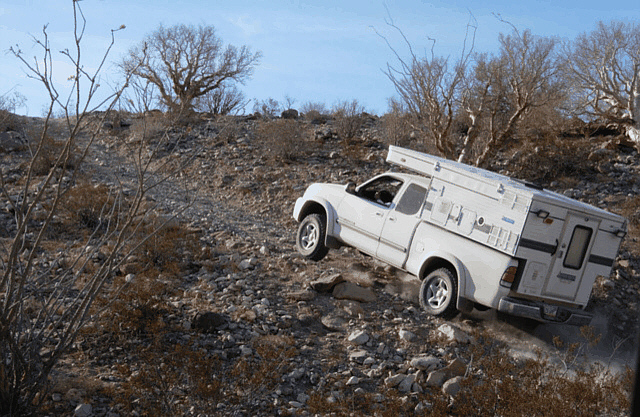 The size and weight of most fixed roof campers and, more importantly, their weight distribution (they tend to carry their weight high and to the rear), make them inappropriate for off-road or expedition use. Coachbuilt models in particular tend to lack streamlining and may consequently cause higher fuel consumption. 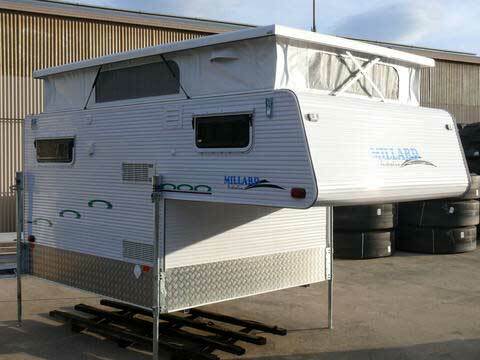 There are three patterns of rising roof found in demountable campers. 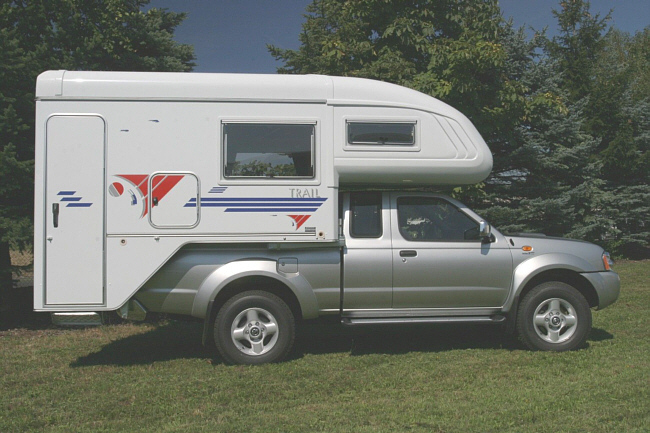 They are pop-top in which all or part of the roof lifts vertically, clamshell in which all or part of the roof hinges upwards (normally with the hinge being at the front of the roof), and telescopic in which all of the roof and the top half of the walls telescope upwards exposing the bottom half of the camper. 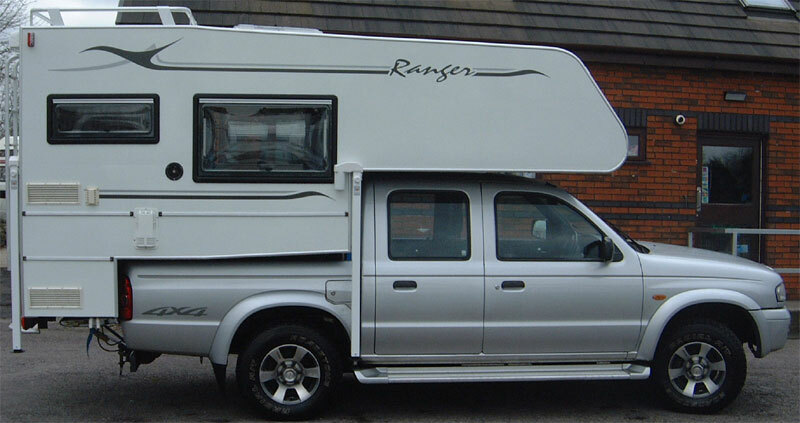 Inevitably, because they have a smaller volume, rising roof campers do not come with the same levels of equipment and luxury as their fixed roof equivalents. It is very difficult, for example, to build a shower compartment into any kind of rising roof structure, even a telescopic one, and necessarily, all storage space and facilities have to be built in below waist level. Insulation tends to be less effective, particularly in pop-tops and clamshells where some part of the walls has to be made of a flexible material. Despite that the marketing of rising roof models frequently emphasises their ruggedness and suitability for wilderness or expedition use. Undoubtedly their compactness helps to limit flexing and adds strength and their lower profile can benefit fuel economy. 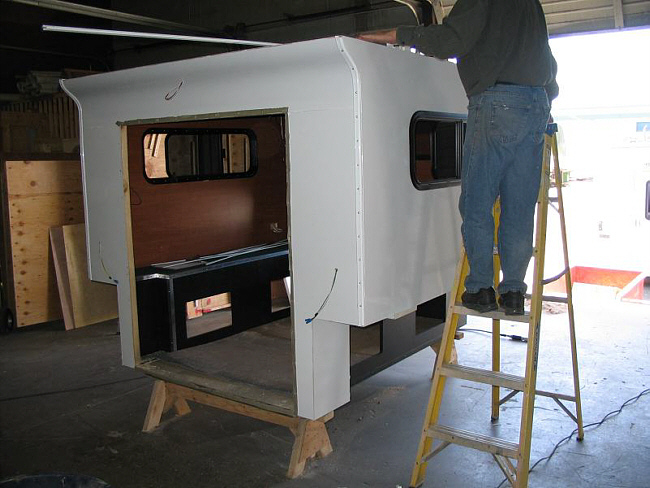 Demountable camper bodies are made in much the same variety as their fixed camper counterparts. They can be roughly divided into those that are coachbuilt and those that have a monocoque construction, and into those with a fixed roof and those with some kind of rising roof. This page aims to explain their differences and their comparative strengths and weaknesses.